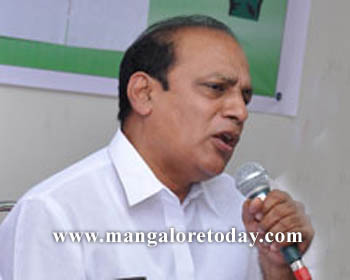 Udupi, Feb 24, 2015: In an interaction with media on Feb 23, after chairing the tri-monthly KDP review meeting; Urban Development Minister Vinay Kumar Sorake directed officials to be prepared to tackle water woes during peak of the fast aproaching summer. The Minister said some areas in the district would face a difficult situation for drinking water owing to the heat and evaporation of the existing water sources. He called upon the officials to be equipped with all measures to prempt the drinking water problems. Pointing out that an integrated action plan worth Rs 690 crore is being prepared to provide the permanent drinking water facilities to the rural areas, the minister said that the proposal would be submitted to the government. Asserting that the work of Varahi irrigation project is in progress, the minister said that the work of around two kilometre is pending completion. The work would be completed by March end and water would flow in the canals in the month of April. Udupi DC Dr Vishal added that the complications concerning forest and revenue, of the irrigation project is cleared. The minister added that Udupi CMC is included in the ADB second phase project, wherein Rs 80 crore would be released for the purpose. The Minister added that the experts would be consulted to chalk out extensive integrated plan to make the district secure against water crisis by 2040. As many as 20 farmers who grow ’Mattu Gulla’ on 16.20 acre of land have suffered loss following the seepage of hard water in to lands. Horticulture Department Deputy Director said that the loss is estimated at a cost of Rs 26 lakh. The farmland and horticultural growth in areas like Katpadi and Heeriyadka have been affected owing to the intrusion of salt water into the fields. The minister added that the officials have been directed to immediately prepare the report and compensate the farmers. Heritage town : Lamenting over central governments delays to approve the proposal declaring Udupi town as ’heritage town’ , the minister said that the central government has declared Badami as heritage town. However, another project of smart city is being envisioned and Udupi is included in the project. It is similar to the heritage town project, he added. He also directed the officials to invest funds released to respective departments and utilise the amount for the mentioned purpose by April 2015. Health Issues ; He also directed that the pending salaries of Group D workers in health department should be paid immediately. He also reviewed the medicine stock and the measures taken by the health department to curtail and handle the H1N1. Sorake directed the official to reach the target for the Udyogini scheme by next month. The official said as many as 238 beneficiaries are selected and training would be provided to them in March. Education : Funds are released for the activities taken up in Bala Bhavan and the activities would be taken up in the month of April and May. As many as 609 beneficiaries are selected under Vidyasiri scheme, who would receive financial assistance. The DDPI said that a proposal for the construction of 72 classrooms has been submitted to the government. As many as Rs 175 lakh is released for the repair works, he added. The minister said a special drive would be taken up for EPIC cards. As many as 62,877 applications for ration cards have been received online in the district. A total of 48,865 applications are attended and 14,012 applications are pending and 7843 applications are pending to be linked with EPIC card. Other general issues raised too were discussed.